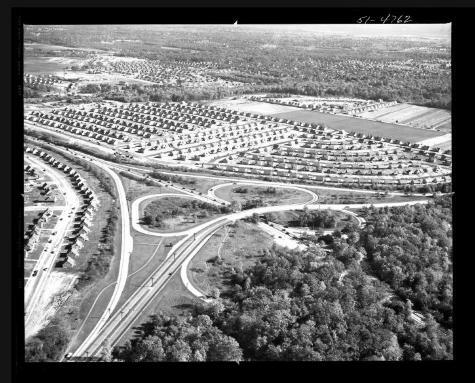 View of the Southern State Parkway, a highway running from Queens to Islip, Suffolk County on Long Island, exact location unknown. The Parkway runs past suburban tract houses. Source: New York State Archives, Aerial photographic prints and negatives of New York State sites, 1941-1957, B1598-99. Box 5, no. 103.